Prep/Thanksgiving/Family Fun/Leftovers. Thanksgiving is a time for family, and as I like to cook, they usually come to my house. This year we had my husband's family and our children, which made for 16 people to feed. Only my two daughters stayed here, so I only needed to do my best to finish my spare room/office redecorating project. When you are redecorating with used items, sometimes it takes a while to find what you want, so it didn't get completely finished (and I had all that cooking to do.) However, I did get the new comforter set in, the rug, bought two night stands used that I needed to sand and paint, got the lamps, and got the drawer knobs in. Here's a picture of how it looked when my oldest daughter came for Thanksgiving: You can compare it to my inspiration picture on my pinterest page here. I am still looking for the chairs, and I have an armoire in the basement that my husband is going to help me turn into a sewing armoire for my birthday. We enjoyed a large variety of food for Thanksgiving. My husband smoked two turkey breasts, and I cooked a ham, pumpkin pies, fruit salad, cranberry salad, corn pudding, mashed potatoes, sweet potatoes, copper pennies, stuffing, and string bean casserole. My mother-in-law brought homemade rolls, chicken salad, and pecan pies, my niece made a cheesecake, and my new niece-in-law made some baked apples. My youngest daughter and I put together some turkey cookies to decorate each place setting: . You can view the inspiration cookies on my pinterest page here. We had lots of fun with family. My brother-in-law brought everyone a picture taken at my nephew's wedding. 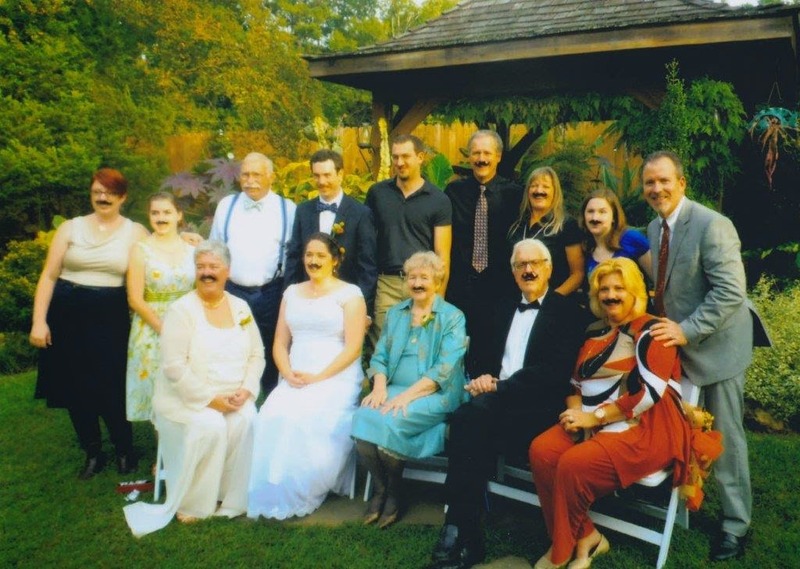 Since my nephew likes his mustache, he had all the groomsmen grow a mustache and wear suspenders with a bow tie. So my brother-in-law stopped by the dollar tree and picked up self-adhesive mustaches and the whole family put them on for the picture. Great memories and family fun can be really cheap. Here's a wedding photo: Once the Thanksgiving meal was completed and family went on their merry way, we were left with a lot of food. The next day we celebrated my oldest daughter's birthday, who picked ham and cheese crepes for her meal. The leftover ham was perfect for this. We also enjoyed turkey sandwiches made with leftover rolls, refrigerator soup, chicken spaghetti, chicken casserole can be made combining the green bean casserole with turkey pieces, and basically, just remaking the food into something else so we won't be tired of it. Hope you had a great Thanksgiving!